The SASH NHS Community Choir will be performing live at Choiroke at the Harlequin Theatre, Redhill, Surrey on Saturday June 10, 2017. Rehearsals are well under way at East Surrey Hospital, Redhill as staff, volunteers and people from the local community prepare for the forthcoming event hosted by BRAVO, , a Surrey-based, not for profit social enterprise that operates across Surrey and Sussex. Choiroke, now in its seventh year, is BRAVO’s flagship annual event and connects people through song and this year seven choirs will perform. Five of the choirs will be performing for the first time. 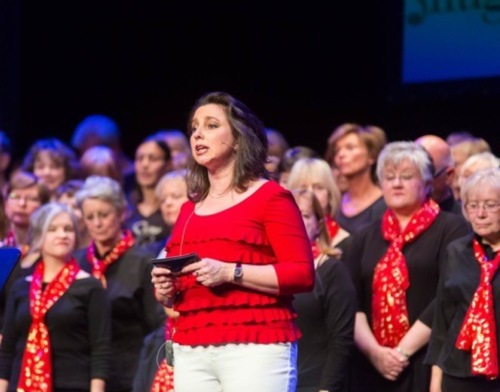 Choirs are brought together from across Surrey and Sussex and perform for one night only. BRAVO is made up a team of volunteers from a pool of local businesses who donate their skills and experience to organise business networking events and to produce their annual Choiroke concert. BRAVO has been producing events since 2010. This belief can be seen in action as she also leads The Include Choir which is an inclusive community choir for people with and without communication or learning disabilities. They use Makaton signing, objects of reference and other inclusive communication techniques to help people understand and take part. The SASH NHS Community Choir will perform live at this year’s Choiroke along with The Include Choir and five other community choirs. For the third year running, in addition to the main Choiroke event which takes place on the evening of Saturday 10 June, there will be a special matinee Schools’ Choiroke, bringing together school choirs from across Surrey and Sussex. Tickets for Choiroke on Saturday 10 June can be booked through the Harlequin Box Office. Tel: 01737 276500. For further information on Choiroke, please contact louise@choiroke.co.uk. Please credit image to Chris Mann. If you would like to interview Louise Camby, Alix Lewer or Sarah Wood, please do not hesitate to get in touch. Media information provided by Famous Publicity. For further information, please contact Mary-Jane Rose on 0333 344 2341 or mary-jane@famouspublicity.com or Adam Betteridge on 0333 344 2341 adam@famouspublicity.com. BRAVO is a Social Enterprise formed as a Community Interest Company (CIC). BRAVO’s objective is to connect business with the community across Surrey and Sussex; it is achieving this by producing business and community events and injecting the profits back into the community by supporting cultural community projects. BRAVO has organised and hosted many highly successful networking events across Surrey and Sussex using interesting, prestigious venues including Herons Bonsai and Vines’ BMW showrooms. Their networking events are unique as they are organised to give delegates the maximum return for the time they have invested in attending. Each event is structured and gives attendees a variety of networking sessions – Spotlight, Open and Exclusive 1-2-1 –. Delegates are given a detailed delegate lists, refreshments are supplied and there is often a guest speaker. Events usually take place in the evening but some are during the day. They have been well supported and have received phenomenal feedback from both delegates and sponsors alike. Team BRAVO is a group of business people freely offering the skills and experience they’ve gained in their respective fields to work together to meet BRAVO’s objectives and fulfil its mission and vision. This press release was distributed by ResponseSource Press Release Wire on behalf of BRAVO in the following categories: Children & Teenagers, Men's Interest, Entertainment & Arts, Health, Leisure & Hobbies, Women's Interest & Beauty, Public Sector, Third Sector & Legal, for more information visit https://pressreleasewire.responsesource.com/about.